One day, while working in Bronx Zoo’s eclectus parrot (Eclectus roratus) exhibit, a visitor asked me what sort of food additives I used to keep the bird’s colors so brilliant and silky. Another, upon viewing a pair of eclectus preening, inquired how I had managed to get the two different species of parrots to bond. The many similar questions that I’ve fielded over the years are typical first impressions: such brilliant colors cannot possibly be natural, and male and female eclectus must each belong to a different species. Many consider the eclectus to be the most beautiful of all parrots. In fact, early in their avicultural history folks rarely tried to teach eclectus to speak…surely such a gorgeous bird could not also be a talented mimic. However, the Eclectus rivals the AfricanGray and Amazon Parrots in both the scope of its vocabulary and the clarity of its voice. 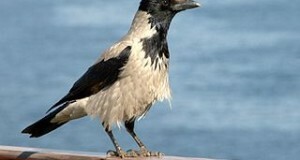 Nearly all individuals learn to speak, with some uttering their first phrases prior to fledging! What’s more, eclectus are equally proficient at singing songs and learning bird calls, whistles and other sounds. A pair I worked with kept me entertained with by mimicking the calls of birds in neighboring exhibits and the clanging of metal pans that occurred as I distributed food each day. Male and female Eclectus Parrots vary so much in appearance that they were believed to be different species by the first Europeans to encounter them in Indonesia. Indeed, few bird species exhibit a greater degree of sexual dimorphism (difference in appearance between the sexes). Eight to ten Eclectus subspecies have been described. They range from the Cape York Peninsula in northeastern Australia through New Guinea, and also occur on the Solomons and many of Indonesia’s islands. Introduced populations are established on Palau and the Goram Islands (Indonesia). Eclectus Parrots favor lowland rain forest, but may utilize wooded savannahs as well. 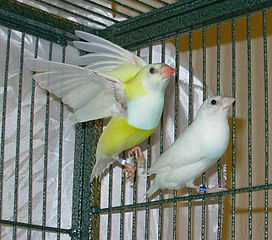 Dramatic sexual dimorphism is not their only “un-parrot-like” trait. 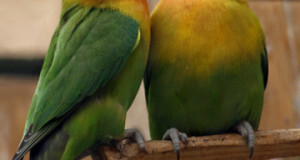 Parrots are known for close pair bonds and sexual fidelity. However, female eclectus parrots mate with several males, all of whom feed her while she is on the nest and raising chicks, and males may mate with several females. This strategy seems driven by a shortage of safe nest hollows (monitor lizards and scrub pythons are major predators in easily-accessible nests). Males are forced to share those females that have managed to secure nests that are inaccessible to predators. Also, females rarely leave the nest hole during the breeding season…the unusual mating strategy may ensure a steady supply of food should the “primary male” die or prove to be a bad provider. Pet Eclectus Parrots are invariably described as “intuitive”, and do indeed seem to sense their owner’s moods very accurately. They are also extremely “laid back” and usually fairly quiet. Although they should be provided with a large cage or outdoor aviary, these qualities do suit them well apartments or small houses. 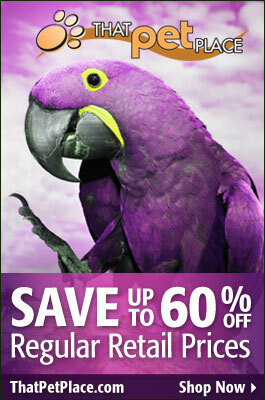 Beauty, great speaking abilities and a quiet, friendly demeanor…what more could one ask of a parrot!? For more on captive husbandry, please see our book on Eclectus Parrot Care. A fascinating account of an eclectus parrot field study is posted here.